The Mayor’s Fund for Education hosted their Year 2 celebration, announced the expansion of Ready Rosie in Long Beach and honored the Heroes Among Us. 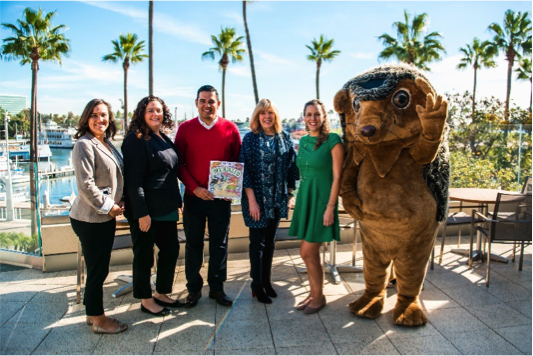 The City of Long Beach (City) in partnership with the Mayor’s Fund for Education unveiled the Early Childhood Education Strategic Plan (Plan). Looking for an internship opportunity? Come work with the Mayor's Fund in Downtown Long Beach! The City of Long Beach will host its first Celebration of the Young Child. Program to support early childhood education and kindergarten‐readiness. The event featured Jan Brett’s latest book, The Mermaid, a story of real and fantasy ocean life. Watch the Live Streaming of "Storytime at the Aquarium with Jan Brett" by clicking the link below starting at 10am on Saturday, December 9th. The Challenge celebrates charities that are making a difference in the community. Support the Mayor's Fund by watching, liking, and sharing the video. Long Beach Mayor Robert Garcia reaffirmed his commitment to supporting the expansion of internship opportunities for students. Public, private and philanthropic leaders break ground on Southern California's first Educare school, joining a national high-quality early learning network. Studies show that children who have quality care in these crucial first years are 50 percent more likely to attend college and 18 percent more likely to be employed. Today, amidst supporters of and leaders in education, Long Beach Mayor Robert Garcia announced the launch of the Mayor’s Fund for Education.